The National Domelight Company (NDC) originally came to us in 2007 (recommended by another client) for their first 'proper' website, having a very basic text-only sales website of not more than 2-3 pages. 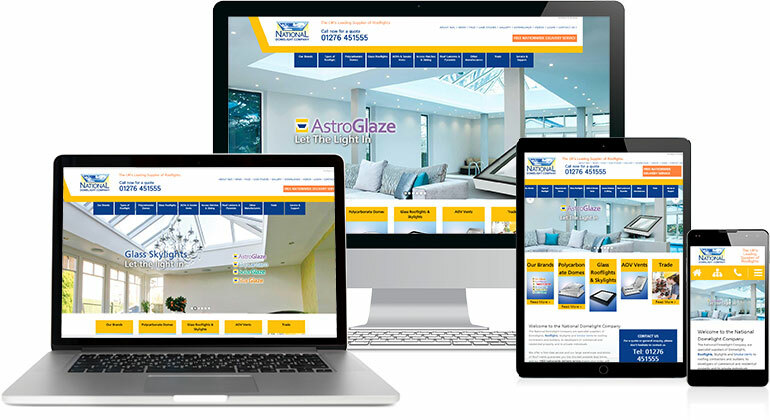 A Surrey-based UK nationally targeted business, NDC sell rooflights and related products and have grown to be one of the top retailers in their field in the UK, with several websites for both retail and trade, both brochures and ecommerce. Having delivered two previous websites for NDC's flagship site, and with our SEO achieving huge and consistent growth, in late 2014 it was agreed with the client that to keep ahead of their competitors a new, modern, well designed and fully responsive site was required. Coordinating the branding work with NDC's print design partner, we sought to produce a new modern site, reflecting the brand and the offering with plenty of space and big pictures, making it bright and inviting, whilst maintaining a comprehensive range of content necessary to maintain and continue to improve the Google rankings. A substantial brochure site, it also had to position itself as one of the main players in the sector, conveying quality, substance, breadth and service all simultaneously, and to a combination of trade, commercial and domestic customers. We started the project with an assessment of the directly competing websites, to gauge the design, functionality and usabilty requirements for the new site, and then we produced initial homepage concepts for discussion with the client. The concept was agreed and then we developed additional concepts for other key pages as well how the site would look on mobiles and other mobile device platforms. Once agreed we built the responsive website, and then integrated this build with the existing content, which was then worked on together with the client to bring it up to date, add new pictures and make responsively any non-responsive legacy content. The new website went live in February 2015 and immediately resulted in improved sales and visitor rates. Despite several major Google updates and algorithm changes the new NDC site has retained its top 5 or better position and year on year visit rates have increased by 42%.